A rescue mission to find survivors from the Dalniy Vostok fishing trawler, which sank in the Sea of Okhotsk off the Kamchatka Peninsula, will continue through the night. Fifty-six people are confirmed dead, while 63 were rescued from the freezing waters. 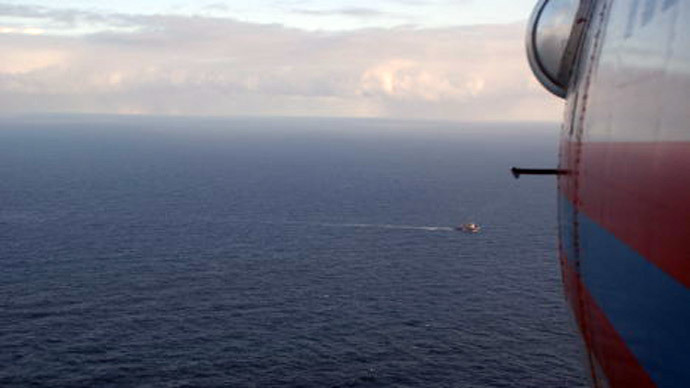 One hundred and thirty-two people were confirmed to have been aboard the fishing vessel, when it sank. Of those, 119 have been accounted for, according to RIA-Novosti. Around 10 of the survivors are in a critical condition, suffering from hypothermia. Rets added that a flooded engine caused the trawler to sink and it was submerged after just 15 minutes. Sources said that the vessel did not even send out a distress signal. However, rescuers said a number of crew members still had time to put on life jackets before the ship sank. One theory being investigated is that the trawler collided with ice in the Sea of Okhotsk, while a source involved in the rescue mission said that safety procedures could have been violated on board the ship. “The main theory concerning what happened is that a large body of ice shattered the vessel’s hull, sinking it,” a source said, adding that there was also the possibility that it had been carrying too much cargo. A criminal investigation is primarily examining possible violations of safety procedures aboard the vessel that led to multiple deaths. Authorities are in the process of interviewing the surviving crew members, as well as the owners of the trawler.